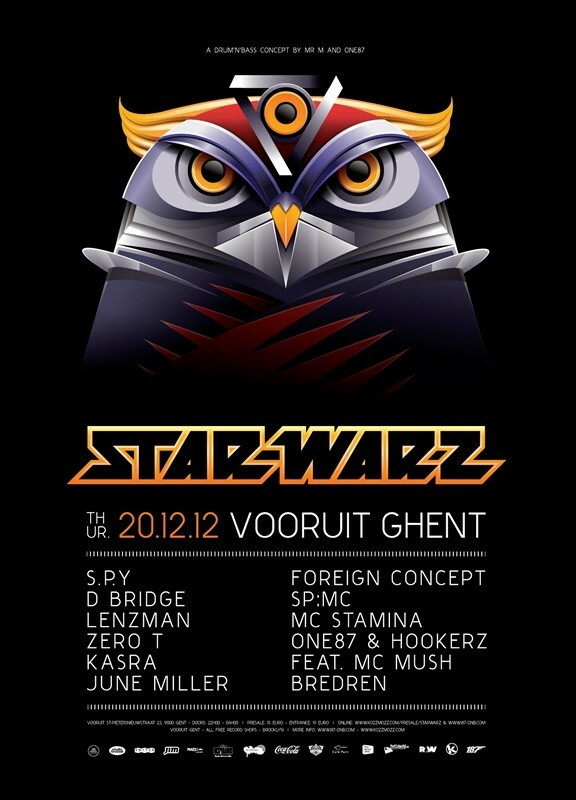 STAR WARZ is an internationally highly respected Drum ‘n’ Bass concept. Star Warz had almost all upcoming or established artists & labels in the scene over and it is one of the partners of Tomorrowland, one of the world’s finest festivals - even proclaimed ‘best festival’ at many awards - since day one. Star Warz was created by Mister M & One87 over 12 years ago and it blew up to one of the finest Drum ‘n’ Bass concepts the world has ever seen. A combination of high quality line ups, great artwork, a top class venue and a heavyweight sound-system is at the base of its huge success. Star Warz is often the concept of choice for label nights and B-days from leading players as Ram Records, Critical Records,Shogun Audio and several Metalheadz nights to name but a few. But this time, it has been a while, no particular label-night. Just great music by the hottest names of the moment, all producing on a whole array of genre defining labels and creating those records that make it to the history books of Drum ‘n’ Bass. We start off with S.P.Y, now exclusively signed to the legendary Hospital imprint for whom he’s currently working on his debut album. But this Brazilian can also be found on Ram Records, Spearhead, Soul:r, Metalheadz and Shogun Audio. Next up is D-Bridge, no stranger to Star Warz and we know why. Taking Drum ‘n’ Bass to new heights with his Exit label, he has worked with the likes of Burial, Skream, Martyn and Goldie. The last couple of years he has formed a strong partnership with Instra:mental. He will be followed by Lenzman who’s known for the more soulful side of Drum ‘n’ Bass. All eyes are on his debut album soon to be released on Metalheadz. Also watch out for Zero T as he has killer tracks out on about any itself respecting Drum ‘n’ Bass label ( from V Rec to CIA, Integral to Metalheadz and many more ). He’s is now ready for his own label so keep your eyes and ears open for Footprint Recordings. And we keep going strong with Kasra who made an indelible mark on the scene with the ever-stronger Critical Music. Top notch productions and steaming parties at Fabric in London for whom Kasra mixed Fabric Live 62, one of the most successful Drum ‘n’ Bass mix albums of the day. Add to that also June Miller who are rocking dance-floors from Fabric in London to Outlook Festival in Croatia and have lots of new material in the pipe-line. More exceptional talent comes from Foreign Concept who found a home at Critical Music after having made waves with tracks on Samurai Music, Ingredients and Shogun Audio. All these masters will be accompanied by two of the greatest MC’s the scene has known. They did it before and they will do it again: SP:MC & MC Stamina hyping you up on the mic! Local support comes from our resident One87 who will be teaming up with the Steam posse in the form of Hookerz and MC Mush. The Bredren trio completes this new, steaming hot and surely mind-blowing edition of Star Warz!